Take the class, and I can put YOUR testimonial online! Register here! Mary-Claire was experienced, knowledgeable. Lighthearted yet specific corrections when needed. Hands on assistance from the instructor and lots of table time were great as well as attention to detail, which helped so much! Very prompt with communication and I can't think of anything that I would change! I loved the "hands on (feet on!)" work to help retain the new techniques. My favorite part was the feet on work and getting to work on the table. Watching Mary-Claire do the work and using a lot of pressure was very helpful. Great class, good instructions! My favorite part was that I got to feel each stroke from the instructor and that Mary-Claire was so funny. :) I liked her fun attitude toward teaching and very supportive instructions. I'm extremely glad I decided to take this course. Looking forward to 2 feet and Ashi-Thai. 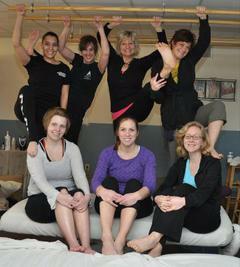 Mary-Claire was great and down to earth; it was a great class. I enjoyed everything and being able to learn something new, and Mary-Claire is a doll! Great personality and great instructor. --When I worked on Mary-Claire, it was very helpful with the corrections and being able to allow me to do the movements correctly!! Everything was wonderful. Very informative and a great learning experience. My favorite part of the workshop? Mary-Claire's personality! She's awesome. Performing the stroke on the instructors--there is no better confirmation in the world! The course organization, content and structure were perfect! Lots of "feet on" practice. The instructors were superb! (Mary-Claire was working with new instructor Pilar in this class). Favorite part of the workshop: Working on the instructor and having her give feedback! The class was so much more/better than I expected. Well organized. Relaxed atmosphere but efficient. Info was well presented for learning-demo, practice, reinforce. My favorite part of class was the practice on the outside clients with teacher and client feedback. Mary-Claire actually came and moved my feet to help me get the motion and rhythm down. I took your class early June (barefoot basics) and want to send you an email saying thank you for being a wonderful teacher. My bars are up and I have been practicing on some friends... I love it! Thank you so much! This rocks! I liked working hands on and watching others do the modality. Nice atomosphere. When doing hands on, she came and guided me through the strokes. My favorite part was quality hands on and the patience of the instructor. Pre-registering online worked great! Mary-Claire has great patience! I was never bored. Material and presentation was interesting. My favorite part was the hands on, especially with the guest clients. It was fresh input. My favorite part was the instructor's lectures and hands-on learning. Learning all about Ashiatsu--Mary-Claire did an excellent job explaining the history and how it evolved into the current workshops. Ashiatsu was by far the BEST course I ever took! I do recommend it to many. I tell all the young ones coming into the profession it is a must if they plan to do deep tissue...I really am in a class all my own here in Macomb, IL as no one does Ashiatsu for miles around. My big fellows LOVE it! Thank you. Last week's workshop was, by far, one of the best I have ever attended. You are a delightful soul and a true pleasure to be with and learn from. My favorite part of the workshop was individualized feedback from the instructor and performing the moves on me. I liked the honest feedback! Correspondence was fast and efficient. My favorite part was all the tips Mary-Claire gave during practice sessions. If one of us didn't do the stroke perfectly, she showed us the right way, and if we still didn't get it, she gave us a tip to make the stroke perfect. Mary-Claire is awesome, patient, and a knowledgeable instructor. I am already planning on taking bamboo massage and two footed strokes! I am very glad I took this workshop. Interesting and fun! Mary-Claire has a relaxed, friendly, fun format of teaching. I loved this class. Staying for the 4th day (Anterior and Side-lying) was invaluable. You are so patient too! Thank you from the bottom of hearts, the soles of our Ashi feet and the top of our spirits for bringing your beautiful smile and energy to us! Your time and dedication are not in vain! You've made this class exhaustingly fun! I love your easy teaching style! Thank you so very much for your skills and patience and sense of humor! My clients love ashi! I do want to thank the big guys again for letting us (me!) practice on their beautiful bodies! Jane and I will both miss our adventures in Ohio! Please come see us sometime! Thanks again! This was a great course- a nice balance of information and hands on! My favorite part of class was learning the new moves for the deepest most luxurious massage on the planet! I cannot wait to take all the classes with Mary-Claire! Mary-Claire made it a relaxing and enjoyable to do!!! Had to have a great sense of humor to be with all of us! She is awesome! Mary-Claire is very knowledgeable about Ashiatsu and communicates her knowledge very effectively. I feel I could not have had a better instructor! Great experience! I look forward to other classes. Mary-Claire is a teacher in the truest sense--knowledgeable, patient and caring. Since we started using Ashiatsu Oriental Bar Therapy® in our office, we have had some breakthroughs that no other type of massage has been able to accomplish. Thank you for your great work yesterday! I feel great today. That was a great massage, and I am very picky! I will definitely be back. No more elbows and thumbs for me. When I need deep tissue, I'm getting Ashiatsu. When you die, you'll become the patron saint of massage therapists. I love Ashiatsu! What I like about Ashiatsu is that it's so smooth and yet deep. I'll never get a hands on massage! This was the most luxurious massage I've ever had. Amazing. Dear Mary-Claire, I just wanted to drop you and Karen a quick line to say thanks for a great workshop. I had occasion to use some of the anterior techniques already--on Friday! I saw a new client who has been having chronic low back, glute and adductor pain since a car wreck in 1997. Medical testing had only provided him the information that it was soft tissue damage because nothing else was wrong. He was even told that he couldn't still have pain after so much time has elapsed. He has been working with another RMT for several years, with minor gains and some setbacks. They both thought he might benefit from the depth of ashiatsu--he is a big man. Anyway, I did a 90 minute session like I would normally do, with an hour of posterior techniques using lots of butterflies and the wave and glute work. Then I finished supine with hand techniques (still need to practice the new anterior stuff.) Then I asked him to put his shorts on and we got "clinical" in the side lying position. I was able to go deeper into his QL, and maybe a bit more in the piriformis, but what really blew my mind was the work I was able to do with his gracilis and adductors. But his gracilis was so messed up I could feel it with my feet. I was able to give deep compression at the insertions (I think, groin region) and it obviously hurt good. He felt like his pain was really being addressed. For my part, it was much more comfortable for me to work with my foot in such an intimate area. When the massage was over, he said he was pain-free and hadn't felt that good for a LONG time. And he had seen his regular therapist the day before.